This will either freak you out, or make you feel better. And yes, this is probably a confession...or at least, me telling you how it REALLY is...I so don't want to be misleading about my erm, greatness! Many of you commented on my workdesk yesterday - with applause because I'm on the top of my game and making Christmas Cards already. Brace yourselves. See, if it were genuinely up to me, I would make my cards at the beginning of December. Imagine, I'll buy stamps and papers probably, from brand new ranges and make them whilst immersed in the spirit of goodwill and fun that the Season creates. It would be obvious from the beauty of each card that it carried with it warmth and love and genuine wishes for a peaceful and happy Christmas. But it's not up to me. 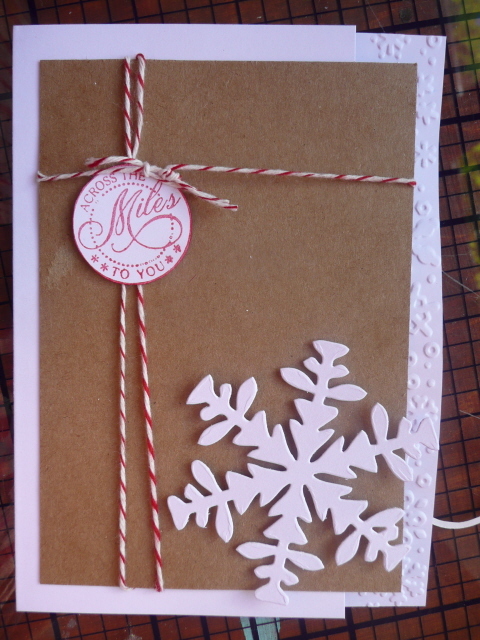 Since I'm a bossy old bird that likes other people to do what I do, I conduct card making workshops...so for this reason, and this reason only, I am making Christmas Cards. Yes, each card sample that I make for workshopeers to copy will end up in my possession, so in theory, I am creating my stock. But I'm not. I don't use them because frankly, by December, when the demand for Christmas card workshops finishes, I'm sick of the sight of them. And all my Christmas stash. I always intend to make more and indeed, sometimes I manage it. But I can't say that they are created in a grotto of cinnamon bathed well meaning. More about that in other whiney posts as Christmas approaches, be in no doubt. The best time for me, is January. I'm full of ideas and raring to get started on Christmas by then. Of course, I'm also lacking motivation and deadline, so I don't actually do anything then either. And let's face it, if I did work eleven months in advance, I wouldn't be able to find them at Christmas anyway. So there, gentle reader, is the bare naked truth about my preparedness. It doesn't feel better to share. But it is real! 3mselect.co.uk at the moment. This is not a paid advert, just thought you may like to know! I feel like Princess Judy when I make small print. Well I never, the counting and cutting has stopped for a day, and I had a couple cards in progress when I took this pic at about 9pm Tuesday night. You can see, I'm fiddling about with the Snowman card...since the picture,it has undergone another radical change and I promise, at some stage, to show it. A Pearl-Ex palette of Stargazers...mica based watercolour paints...lovely. Very retro really, but I note that one of the top demo products at Ally Pally last week was puff paint, so I guess in a way I'm in the right 'trend' area! It's a fine mess...rolls of glue dots that were stacked have been knocked over by a pot of embossing powder, used, inky stamps cast aside, the button jar open for no good reason and I've broken out the chewing gum. That's a sign of monotony...I like to chew whilst I count and cut lots of card...it stops me wanting to wander off in boredom - to the kitchen! I must add that amongst this week's non planned stuff is a journey up to North London in the big old van tomorrow. Collecting a dust filtration system for the joinery. It's all glamour. And it's stopping me doing a lot of other planned stuff, I can tell you. This was not on my list! More interesting is YOUR work surface, share it with us, please! Photo, post on your blog, upload with a WOYWW in the title and link here. Easy. Visits will occur. Reciprocal visits are polite. Advertising is not. The art of craft fairs.. The weather forecast meant that Saturday afternoon would be the best chance for an autumnal stroll in the sunshine. So we went to a Michaelmas Fair at Weyhill village Craft Centre. Michaelmas is the feast of Saint Michael, and in very public schools, this academic term is called Michaelmas. More erm, commonly, we use it as a marker really for the onset of Autumn. It was a gorgeous day. Look at the colour of the mid afternoon sky. Chilly in the shade, but no matter. There were some wonderful craft stalls. The scene stealers were the carousel and the helter-skelter, don't you think. Wonderful painting - there the brave St George towered above us, keeping us safe and frightfully British as we went about the craft stalls, bravely ignoring the people who run them. Lest we feel obliged to make a purchase. It's a funny thing that isn't it. A sort of passive guilt. Very noticeable if you've ever been a stall holder though. Can easily be confused with rude mannered customers. But equally, if you run a stall, after a brief summary of how/what/who, please leave me to browse. The 'hard sell' is as big a turn off to the customer as the ignorant ignoring customer is to you. So strike a happy medium huh. And if you run a stall..try to look busy-ish, engrossed in your craft, even...makes you more approachable, gives your wares a greater credibility and stops you looking horribly bored. Equally, I promise not to pick up every damned thing, talk to you with my mouth full of home made food or tell you how expensive your stuff is. This really is the season for craft fairs and hand-made gift buying - so come on stall holders....add a comment, see if you can educate us purchasers! That's the current workroom mantra. 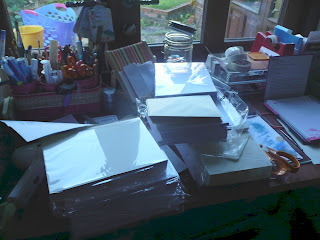 I'm doing my half of the preparations for the Card Marathon which has come suddenly upon us. Indeed, this means that next weekend is the last weekend of September. Don't ask me how that happened - I had my back turned too! Every surface is gainfully employed with erm, stuff. Scrap Lady Ally and I make 12 cards each and kit each card for repeating by 20 odd people. I don't mean odd people. I mean 20 odd. This is the *ahem* cutting station chez workroom. It's currently home to the basket of Christmas stamps and a storage box filled with bits that I've 'set aside' over the last month because I've learned that when I need them for PPPPP week, I won't be able to find them. Because I haven't learned to put things away in a properly designated way. The workdesk is where the counting and sorting go on. Currently it's filled with envelopes and pre-scored card blanks. This will change as the day wears on. 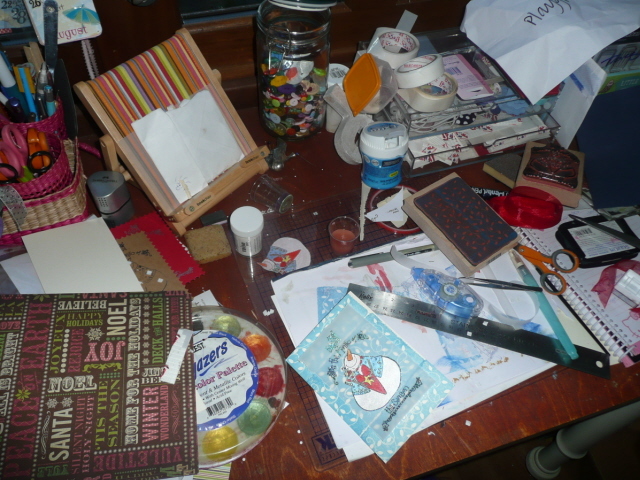 It will become filled with regular Christmas card making stamping paraphenalia. Because I've learned that I don't count to twelve terribly well. I only have eleven cards ready for the Marathon. Luckily, I was tempted to buy a beautiful new stamp when I was at Shopkeeper Gal's on Thursday. See, I've also learned how to justify my impulse purchase. I'm working on the justification for the Kraft crepe paper, the Stickles in fab new colours, the new harlequin printed kraft 12 x 12 ...you get it. I have learned though, that you can't immerse yourself in what appears to be a shambles without having first a solid and relatively ordered foundation. After all, PPPPP isn't really just for this week. (*ahem*). Ta Na. It's pretty orderly. The top shelf is photo quality and other printer papers that are accessed by others..which is why it's all just shoved in. But you see, I am a closet tidy person, in some small way. I've learned. And it helps to have a furniture maker as a husband, I realise. 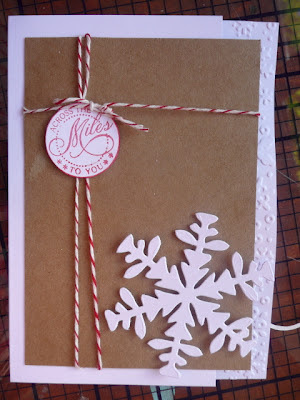 PPPPP week is the key to our customers (friends) enjoying their day of card making. I've been to a couple of workshops where I've spent more time in preparation than creating and that, if you ask me, is a waste of my money..I don't need lessons in scoring and cutting and I certainly don't wanna pay for the time I spend doing it. No sir. Yes sir, that's my opinion. I know at this stage that Scrap Lady Ally is already finished and fully prepared. She works full time and so has less time. Go figure that though..way less time, and she's ready. I don't know why. But I've learned from this too. I don't let it panic me; I simply moan about her efficiency to anyone who'll listen. I tell them that she only does it to show me up. And that it isn't enough to make me panic. A distraction technique, naturally. I'm not in a panic per se, but really, can you imagine that even with my PPPPP mantra, anyone will ever be moaning about me because I'm ready before I need to be? I took this on Tuesday, late morning. because the light was so good - see, early autumn sunshine has caused the Suzy Homemaker in me to get two loads of washing on the line. Gracious. A sure sign that I'm making the most of what's left of late summer. This is a good angle for seeing the before and after of a couple of days really. The pile in the immediate foreground at right is part of my clear stamps collection..having been rifled through for something or other yesterday. The tidy trays, perenially to hand are in the stamp cleaning basket...because they too could do with a clean. You can see that Miss Dunnit had just delivered me a mid-morning coffee. At this stage of the day, I'm doing other work and trying to clear space in the day to play at this desk. You can see my old and untrendy iphone and the basket at the end holds ribbon and distress stains. I took them to the crop at the weekend and hadn't quite got around to putting them in their proper places. Behind that basket is another yellow plastic basket - a collapsible RUB of about 5 x 7 that I use as a bin on my table when I crop or demo. Not put away yet. Not overly exciting this week huh. Nor is it, 8 hours further into Tuesday. I tidied, and got on with cutting and counting and preparation, so there's not much to show. Except it's a ll a bit tidier because to create room to make a mess in, I had to tidy! Be more inspiring will you? Show us what you're doing at your desk today - upload a pic to your blog, put WOYWW in the title and link it here. Visits are reciprocated as far as is humanly possible. Don't be blatant about your products and don't link to any old post just for hits...that's not in the spirit of the thing. And if you can, turn off word verification. If only for the day! Classic proof of procrastination. I did this LO at the Crop on Saturday. Kate is currently seven years old. When I worked at a proper job that required me to turn up to an office at a suitable time every day, Mondays were a bit difficult. I have had other types of work too, and to be honest, Mondays have pretty much stayed the same. Since I've been at home working for our own business and dabbling in this and that, Mondays are very much less about the end of a good weekend and more about the start of another busy week. I like the potential of the week before me and the opportunity to plan a bit, maybe even have a finish line in sight for some longer term stuff. It suits me. Despite appearances to the contrary, I like a bit of order! I am a list maker as you know, so Monday is a list day, be it mental or actual. Probably because I'm a supremely skilled procrastinator, I like to have a couple of achievable targets. Interestingly, I don't physically record these. They lurk at the back of my mind as if a secret challenge. They aren't secret of course. For if I don't do them, someone has to listen to me whining about lack of time and the utter flexibility that I have to display to please everyone all the time. Really. I have a spectacular capacity for inner Diva. So today is a good, positive day for me. I have a handle on the things I need to do, the things I want to do and the things that I've erm, carried over from last week! Now, the key is to make a start. And that's where all the philosophy in the world won't help! Surprise...more proof...these photos taken in 2010....LO made at the Crop this weekend! I've occasionally posted about tools that I would rather not live without, and mostly I note, they are the sort of 'fashionable' must haves - my love-hate relationship with the Cropadile for example. I have really overlooked the simplest of them. Norma asked on Wednesday what I used this for.. My genuinely useful, used and loved 'tidy tray'. Many of you know about it and recognise it. It was introduced to me as the 'powder catcher' for heat embossing. Place your pigment ink stamped image on/over/in the tray and pour on the embossing powder. Let the tray catch the excess and then replace the excess powder cleanly and simply in the pot by way of the handy funnel type spouty thing. I know, really, I'm so lyrical. I love this tray. It's a handy corral for bits and pieces when I'm moving from table to table. A tool caddy of sorts for last minute crop packing. And of course when properly washed in hot soapy water, it isn't static and is a wonderful tool for catching beads or glitter too. Argh, glitter. Almost as difficult to talk about as Christmas! When I first bought tidy trays (I don't know if this is a TM name or just something that is in my head as the generic name) they were incredibly, stupidly expensive - over £10 if my memory serves me well. They have of course, since become much much cheaper. Thankfully. But do you know, for all that, these are probably the one tool on my desk that I have never, not once had cause to complain about. I use it every time I sit at my desk, and in over ten years, it's fair to say they are really worth the investment. Genuinely, a tool I would have to immediately replace. Now that is, I think, an unsung desk hero! Ouf. My desk is a dumping ground this week; haven't been working at it since Thursday and you can tell. Good news though..mostly the things you can see are new purchases - some stock for the card marathon at the end of the month and possibly an ink pad or two and a small stamp or two from my unexpected and not planned trip to Jennie's new shop. So you can see the darkness means that I'm showing you Tuesday night's photo, I plan to change the look of the desk today. I really do. Inspire me then - show what you're doing at your desk today..place of work, rest or play..we like to see what you've got, where it is and most frequently commented on - how tidy it all is! Put WOYWW in your blog title so we can find you easily and add your link here. Oh and by the way - if you're coming to the WOYWW Crop on October 13th, please scroll down and read the previous post. Thank you! Well, OK, it's a Custom's house in a small spanish port....but it's still a house! Now then, at the risk of alienating a lot of bored readers with another post about something they aren't involved in, there are questions and info required from you if you are planning to join us at the WOYWW Crop on Saturday 13th October. We've had a change of location for improved parking and table numbers. The nearest rail station is PEWSEY and collecting you from there will be no problem if that suits you. Equally if you can only get to Andover station, it''s not a problem, but we'll definitely need to know so that you aren't ignored! Tell me your email address - this is important, you'll get an email in good time from Jan or myself which will have route directions for you drivers and any other info we think may help. Your email address is really the key here, leaving comments on your blogs is at best erratic and rather too time consuming! If you're being driven by someone who isn't cropping, there's plenty around here to visit, look at and walking and outdoorsy stuff too. I recommend a bit of research, based from the village of Burbage in Wiltshire. The last thing I have to say is a bit more bossy than usual and probably intensely cheeky...but please, don't bring gifts. Times are tough; we're getting together to meet and have a fun day. Pressure and stress over such things is not necessary, we have a few things planned to make the day slightly more memorable without breaking nerves and banks! Right. Go ahead and email me then. Thanks. No, I haven't been promoted. That's such an unlikely scenario! No, I haven't anything to brag about on behalf of somebody. BUT..I do have something of interest to give away in the interests of Promotion. Yep. Again because of the traffic that you cause on this blog, I was asked to do some publicity with a 'gift' to give away. Great stuff, me likey. So here in dear old Blighty, at our National Exhibition Centre each winter there's a large craft fair called Hobby Crafts, Crafts for Christmas and Art Materials Live. You Northern Americans would probably call it a craft convention. Colloquially, it's called and referred to in craft circles as 'the NEC'...which is the acronym for the venue, see. It's a biggie. And the good people in media have given me two tickets to give away. Makes me look hugely generous doesn't it! So if you'd like to win a couple of tickets that will give you free one day entry on any of the four days that the show is open (8th to 11th November) leave me a comment. Naturally, there'll be a hugely safe and democratically controlled, fairness monitored draw by Miss Dunnit, referee extraordinaire. Me and that Lunch Lady Jan were thinking that we could probably tip up on the Friday (9th November) and maybe look around for a few WOYWW badge wearers. And do a teeny bit of shopping, of course. We'll do the draw before the end of September so I've got enough safety time to send the tickets to the winner. And so you've got enough time to check the dates and make sure that you can be there! So you can see the makings of a card that will include some liberal application of H20 paints; and some fab, almost neon coloured Stickles...really looking forward to breaking them loose. See, this is the thing - I've spent loads of time working on cards for the Christmas Card Marathon and then woop! about turn and start on a 'Citrus' themed workshop - to encourage and celebrate the Indian Summer we deserve. Hmmm. So that's pretty much what you see - the pile of clear stamps in the real foreground at the top is indeed the 'clean me' basket of stamps; but I'm on a roll and I don't care. Even less than usual that is! Strut your stuff for our viewing pleasure won't you? Share your working space and what you're working on, it's a matter of great fascination. If you can, turn off word verification - you'll get more comments, for sure. If you can, keep the post brief- ish, and please put WOYWW in the post title..if you don't, other WOYWWers will assume you've linked a post that isn't relevant and click away....there is ALWAYS another desk to go look at! You know how there are evenings when you want to stay slumped in the armchair, in front of the TV or to share the benefit of your very presence with your family? And you know that even though you are slumped in the armchair, there's that creeping feeling that really, you could be doing something whilst you slump? But you can't drag the contents of your desk into the lounge. Mostly because of the fight you put up to actually achieve a desk and a space for your stash...and the argument that it would keep the lounge room tidier? And you can't do colouring because the light is rubbish. And you don't knit or crochet because well, even that seems like hard work while the TV is on and the family are erm, riveting company. And it's such fun..filled with prompts for ideas to get you doodling and sketching. Miss Dunnit was quite enthralled by the idea and I have to say, so was I. I love the sense of humour and the lack of pressure it presents....no blank page syndrome (pardon the pun) and no 'lessons' or star shaped 'top tip' boxes that always make me feel as if I'm dong something that's more worthy than having a bit of creative fun. It's not pretending to be an art lesson or a channel for your creativity Marge, it has that rare quality of not taking itself too seriously. Which is an editorial skill huh. Ask me, I edit all my own work! If you doodle to the point of being confident about using colour, the black and white prompts really let your additions stand out - which is really quite a thrill when you leaf through it some time later, looking for another inspiration point or just giggling at some graffiti style drawing that you did on a fishbowl, false nails....you name it - some of the prompts are really fun...I particularly like the 'You are an American' page - a Statue of Liberty and a row of empty pedestals....we had quite a long to-and-fro about who deserved to go on our pedestals I can tell you. I mean, do Ben and Jerry get a plinth each? Or do I draw them hugging so as not to fall off? See, a prompt that causes creeping intellectualism....*ahem*! It's published by Quirk and is available now; the RRP is £13.99. It's a handsome sort of coffee table book size and has the useful bendy card cover that we are still calling a paperback. I can think of a couple of people on my Christmas list who would enjoy this, and for the price it will make a great gift I must say. This review is entirely sponsored by Quirk Publishing. They asked me to and I said yes. They sent me a free copy of the book. Luckily, I love it and so my tact and diplomacy gene has not been stretched.